Handmade 3 Piece Set Silver 950. WE NOW MAKE ALL OF OUR PENDANTS AND EARRING CHARMS IN SILVER, YELLOW or ROSE GOLD or COPPER! CHANGE THE WIRES AND YOU CHANGE THE LOOK. The entire set is made of Solid Sterling Silver. GREAT GIFT IDEA. Side Stone: Cubic Zircon. 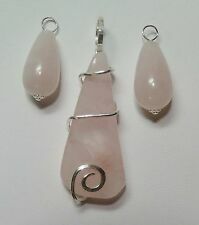 Central stone: pcs.3 pcs.Natural Rose Quartz. Product: 925 silver set with natural gems. Material: 925 silver pink color. The size of the gemstone: oval cut 8 10 mm. Gemstone weight: approx.7 ct (3 pcs.). JEWEL OF INDIA. FREE FREE FREE FREE (Worldwide). New, never worn, Gorgeous Handmade Sterling Silver 925 cluster drop choker necklace. Handmade with rose quartz and pearl gemstones. Set retails for $76 Necklace measures 13-15” long. Please check out my other listings for matching pieces. This is a unique piece and would be perfect for a night out, special occasion or a wedding. Necklace comes in a gift box. Item is mailed out within 1 business day via USPS. Please contact me with any questions prior to buying. 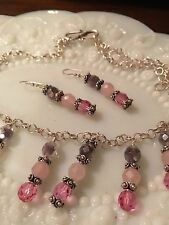 This Set is a Gorgeous Necklace and Earring Set. All of Set is made of Sterling Silver including the findings and Chain Portion of the Set. The Clasp is a Sterling Silver S Shaped Clasp. This set would make a Lovely Gift. MAIN STONE : Rose Quartz. SECONDARY STONE : White Topaz. MAIN STONE SHAPE : As Seen In Picture. MAIN STONE COLOR : As Seen In Picture. Q : Is the stone Natural or Lab - Created ?. 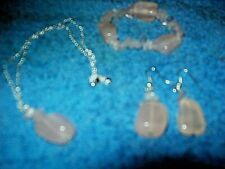 HANDMADE ROSE QUARTZ SET COMPRISING STRETCHY BRACELET / DROP EARRINGS. AND A PENDANT ON CHAIN.THE EARRINGS ARE ON SILVER PLATED WIRES. Rose quartz crystal bead, pink crackle glass bead and a pink candy stripe swirl bead, all attached to a silver plate ear wire hook. Handmade earrings.